I've literally been in love with this print since I discovered Bernie Dexter. But this dress is NEVER on sale (or very rarely, I should say, and during moments where I'm not flush with cash). I always assumed I'd get the Frenchie style, though I was also holding out hope for a very elusive halter version of this dress since that's my favorite Bernie Dexter style. Earlier this winter I saw this version (Lulu) of the dress pop up for $40. 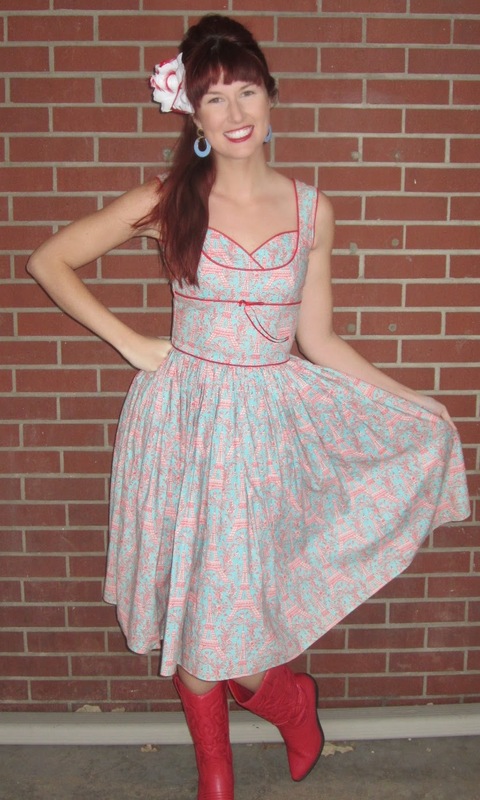 I Googled it immediately because I had never seen the red eiffel tower print in this style, so I wanted to make sure Bernie did do that version (majority of her fabrics can be found elsewhere so I'm careful about knockoffs) and I found several photos on Google images of other girls in this exact dress. $40 for a Bernie dress is ALWAYS a steal, and the seller had listed that number as the price with no bidding, so I immediately seized the day with this one and purchased it! A little over a week ago, I spoke about another Lulu style dress I had gotten around the same time. I mentioned there that the cut is slightly tighter than other Bernie dresses. While both fit, they are really tight! So definitely size up if you are between sizes or already feel somewhat snug in the Bernie dresses you already have as they're tight around the ribs and ride up into your arm pits slightly more! I'm a true XS in BD dresses, but if I find another I like in this style I'll probably get the small to have a little more breathing room! PS- You may have noticed on my Instagram that I've recently adopted a pair of flashy red cowboy boots. I imagine they may be polarizing, but I'm having a blast with them! Initially I was going to wear one of my usual tried and true pumps with this dress, but at the last second put these bad boys on instead because it was slightly colder out and I knew I'd have all summer to wear this dress without boots. Wearing cowboy boots in this photo shoot was a lot of fun because I got to vary up how I pose with the feet and hold the dress because it wasn't as "proper" as I usually look! Hope you enjoyed too! 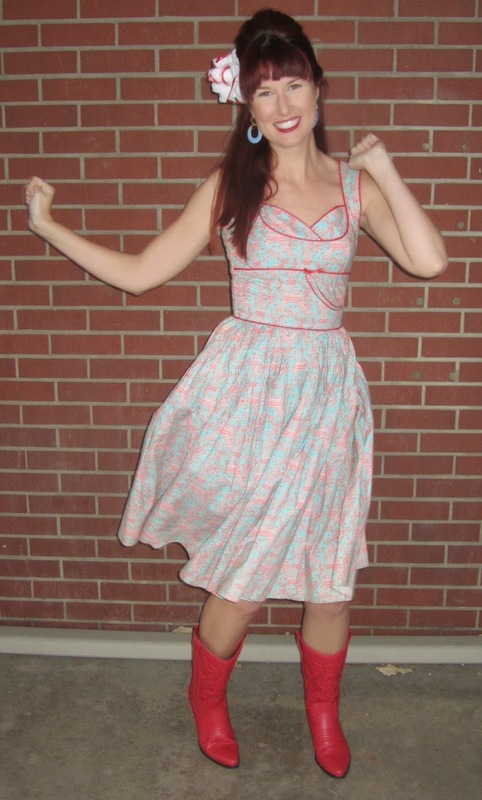 Awkward twirling photo! I couldn't help but add this because I just look so darn happy here despite that my footwork is a little flat!